Pattadakal is home to several world heritage sites in India. 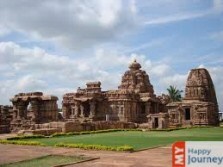 In Kannada, it is also known as Pattadakalu, which is a very famous village in Karnataka. Situated in the region of Bangalkot, on the banks of river Malaprabha, it is around 10 kms from Aihole and at a distance of about 22kms from Badami. The village still preserves the ancient architecture right from the 8th century to the Chalukya Dynasty; it has huge collection of monuments, temples and remains of Chalukya rulers. Apart from the great art work of the Vesara style which can be seen on the famous Hindu temple, the temples here are recognized under the name ‘Chalukyas’. The rulers along with their skilled craftsmen put in their complete effort and designed the temples in Nagara and Dravidian styles of architecture. To mark its uniqueness among other shrines, they built a Jain Sanctuary, with a pedestal and small idols of the deity within its premises. However the most eminent structure amongst all is the Sangameshvara Temple. It was built under the supervision of the great Chalukya King, Vijayaditya Satyashraya. He used the idea to imprint Nataraja sculptures on its outer and inner walls and Sanctum in its inner regions, thus making it a significant shrine in the southern India. One major fact about its temples is that they depict the artwork, dance forms and the music but the culture and tradition of the village is nowhere to be seen, thus differentiating the art form from the culture. However, if you wish to explore the rich traditions and culture of Pattadakal, its festivals mark a great example for you, namely the Virupaksha Temple Car Festival, Banashankari Temple Festival and the legendary Mallikarjuna Temple Festival.